RNL Bio Chairman Ra Jeong-chan, who commissioned the experiments, said the research testifies to the correlation between stem cells and longevity, which he expects will be eventually applied to human beings. "Mice from the experimental group survived around 30 percent longer than the control group, obviously thanks to the stem cells infused every other week," Ra said in a recent interview with Business Focus. "The former were also found to be less vulnerable to cancer, one of the major killers of mice, compared to the latter. Some were even still alive after two and a half years." He added that the research will be featured by a foreign peer-reviewed journal later this year. The study is in line with previous assumptions of Ra ― adult stem cells not only deal with degenerative diseases like Alzheimer's or diabetes but also help human being fight aging. In other words, he regards stem cells as the fountain of youth, which humanity has avidly sought to chalk up a victory in its holy war against sickness and aging. "Aging is a kind of degeneration and stem cells are about regeneration to grapple with this,'' the 49-year-old said. But Ra does not claim that mankind can turn back the clock indefinitely ― he is smart enough not to believe that senior citizens can be instantly rejuvenated via the sorcerer's wand dubbed stem cells. Rather, he thinks that stem cells will help people have a very healthy life during their naturally possible lifespan, which he thinks will be in the neighborhood of 120 years. Currently, less than half a million people are aged over 100 out of the world's total population of 7 billion. The proportion of centenarians would substantially jump if Ra's ideal of extended life with the assistance of stem cells comes true. "Economically active people are typically defined as those who are between 15 and 60. As stem cells can extend a healthy life, the age limit can become 65 or 70 down the road,'' he said. Ra and his company RNL Bio are all about adult stem cells, which traditionally gained less attention compared to embryonic stem cells. Stem cells refer to primal and undifferentiated cells from which other cell types are derived. They earned the name since every single cell in the body "stems" from self-replicating cells. The "master cells" can be classified into two major segments ― embryonic and adult stem cells. Embryonic stem cells have the potential to become all cell types in a body, amounting to more than 200 types including bone, muscle, skin and blood to name but a few. While embryonic stem cells are considered capable of forming all cells and tissues, adult stem cells have been believed to create specific cell types similar to their tissue of origin. For one, skin stem cells are committed to one function of producing skin cells and do not have the ability to morph into anything else, such as muscle or blood cells. Embryonic stem cells were likened to directors who oversee everything during a play, while adult stem cells were compared to assistant directors, who give cues for specific scenes. Yet, recent research negates the conventional belief ― adult stem cells were found to differentiate into various types of cells although their range is somewhat limited. In that sense, embryonic stem cells are called pluripotent while adult ones are dubbed as multipotent. In particular, adipose-derived stem cells, which are taken from fat tissue, have been singled out as being outstandingly versatile. Ever since human embryonic stem cells were first isolated around 10 years ago, they were touted as the future of the medical industry and scientists resorted to therapeutic cloning to get them en masse. They presumed that embryonic stem cells would let human being grapple with such incurable illnesses as Alzheimer's or diabetes thanks to their capability of developing into any cells in the human body. By contrast, adult stem cells were sidelined by leading scientists ― they were deemed second-rate because they were regarded as less capable in multiplying and the number of types they can develop into. Korea's discredited scientist Hwang Woo-suk claimed to have made tailor-made human embryonic stem cells in 2005, the fake breakthrough printed as a cover of the famed U.S. journal Science. Even after they were proven to be based on doctored data and there were no patient-specific stem cell lines at all, the research world's interest was mainly about embryonic stem cells. The recent frenzy pivots around induced pluripotent stem (iPS) cells ― somatic cells were transformed into ones that behave much like embryonic stem cells as both can differentiate into any cell type. Its pioneer Shinya Yamanaka of Japan won the 2012 Nobel Prize in Physiology or Medicine for his famed discovery that mature cells can be reprogrammed to become pluripotent. At a time when a majority of world scientists paid their attention to embryonic stem cells including iPS, Ra mostly flirted with adult stem cells during the past decade. For him, a pious Christian, embryonic stem cells cannot be studied since they are extracted from embryos, the very seeds of life that will be destroyed in the process of extraction. iPS cells are free from the ethical dilemma because they are made of mature cells and that's why Ra works with them. But his bread-and-butter topic is still adult stem cells. In addition, as far as embryonic stem cells are concerned, Ra raises such big problems as immune-rejection and the risks of causing cancerous cells ― the reasons why Ra remains committed to adult stem cells. The entrepreneur believes that therapy based on adult stem cells will be a reality in the not-so-distant future. "Up until now, more than 17,000 people have received stem cell treatment, mostly through intravenous injections of human adipose-derived stem cells,'' he said. "In around three years, the so-called incurable diseases will be overcome by the mankind thanks to stem cells. One of the first targets is senile dementia and Alzheimer's." Along with professor Suh Yoo-hun at Seoul National University, Ra conducted an experiment where fat-derived human adult stem cells were injected into mice with Alzheimer's disease. They found the mice substantially improved. With regard to cognitive function, they nearly recovered to normal. "Clinical tests will start this year at the earliest and completed in three years. In my view, the year 2016 will be remembered as the time when Alzheimer's disease treatment effectively started." Stem cell treatments are delivered in two modes. The first is to inject them into the affected part and the other is to infuse them through the vein. In the latter case, stem cells find their way to the troubled area via the "homing effect." 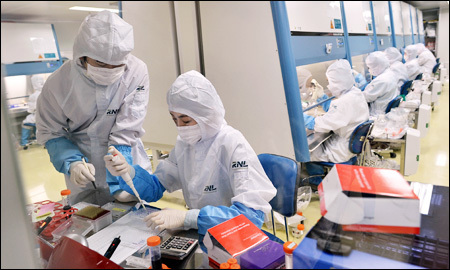 Researchers of RNL Bio culture stem cells extracted from human fat at the firm's laboratory at asan Digital Complex in Seoul. They will be injected into the donors of the fat for cell therapy. Ra's works are not free from controversy. First and foremost, suspicions on any stem cell work still linger in Korea due to the aftermath of the Hwang Woo-suk case, which spawned broad-based distrust in anything that has to do with stem cells. In this climate, some even labeled Ra as another con artist in the face of his iteration on the outstanding effects of adult stem cells. In 2010, two people were reported to have died after getting intravenous injections of fat-derived stem cells, which prompted RNL Bio and Ra to teeter on the brink of collapsing. Later, Ra and his company overcame the troubles as they were found not to be related to the injections but similar claims could cause another nightmare for Ra and his firm. Worse, the long-term health implications of such stem cell injections are not known 100 percent yet and it will take quite a long time to win wide-ranging trust based on numerous cases. Also at issue is RNL Bio's negative bottom line ― it is still dearth of a large and stable enough cash flow compared to the immense research outlay needed for the pioneer. His company has been forced to splurge on research and development as it blazes a trail while the earnings stream has yet to reach a breakeven point although the size of the deficit has been reduced over the past few years. Since its foundation in 2000, RNL Bio has increased its capital several times but the Seoul-based outfit's accumulated deficit amounts to more than 100 billion won and it is expected to remain in negative territory this year. Against this backdrop, some come up with concerns on whether the company will be able to continue to channel large amounts of money into the time-consuming and cash-hungry business. Centuries ago in the United States, tomatoes were for watching, not for eating. Americans thought that tomatoes generated fever, which could end up killing the eaters. A colonel bit into a tomato despite warnings of doctors not to do so. As he remained healthy even after eating the tomato, people started to eat them, which is now regarded as a well-being food. This is an episode, which Ra frequently mentions as an example where people show their suspicion toward the unfamiliar ― he thinks the tomato story is similar to stem cells. And Ra strives to emulate the U.S. colonel as he has had stem cell infusions for 46 times beginning midway through 2008. "After the stem cell treatments, I become really good. I feel very healthy now. I wanted to show people that stem cell treatments are safe and reliable," the veterinarian beamed. With regard to financing, Ra expects that things will improve as an increasing number of people turn to stem cell therapy. "Many doctors ask to perform clinical tests with stem cells. I think that we can rack up 1 trillion won in turnover by 2015 if we can successfully deal with such illnesses as Alzheimer's or arthritis," he said. Plus, when the country allows the injection of stem cells, RNL Bio would gain great upside momentum ― currently, it is outlawed. Hence, patients receive the treatment in places such as China and Japan where they are permitted. Ra expects Korea will follow China and Japan, and permit treatments during the latter half of next year as some U.S. states have already done so of late. Over the long haul, Ra is confident of the success of the venture on the back of his company's technological competitiveness. "As far as the adipose-derived stem cell injection is concerned, we are ahead of the pack by a couple of years. We strive to extend the gap to around five years based on follow-up research," Ra said. No matter how big the future potential of RNL Bio is, its major recipients will not include Ra because he promised to donate a vast majority of his assets. Currently, Ra holds about 10 percent of the shares in RNL Bio but he has pledged to contribute 90 percent of them to society and indeed donated some of them earlier this year. 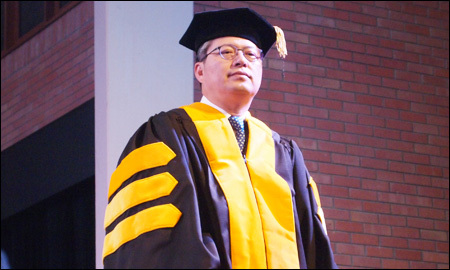 RNL Bio Chairman Ra Jeong-chan got his bachelor's and master's degrees at the College of Veterinary Medicine, Seoul National University. He started his professional career at Bayer Korea in 1987 and moved to LG Ghem in 1994 to work for the country's largest chemistry company through 2000. He founded RNL ― which stands for revolution of natural life ― Bio in 2000. Originally, it was not a stem cell company but its focus moved to adult stem cells in the mid 2000s to eventually become one of the most advanced players in the world in terms of technological edge. Ra gained his Ph.D. at Jeju National University in 2008 and got an honorary doctorate at Belhaven University in Jackson, Mississippi this year.